Upper Souris Watershed Association is an independent, non-profit organization that has been developed to implement the key action items from the Watershed Protection Plan. The USWA was incorporated as a non-profit on February 24, 2010. Not only do we want to improve water quality and water quantity within the watershed, but ensure water for social, economic, environmental and cultural uses for future generations. 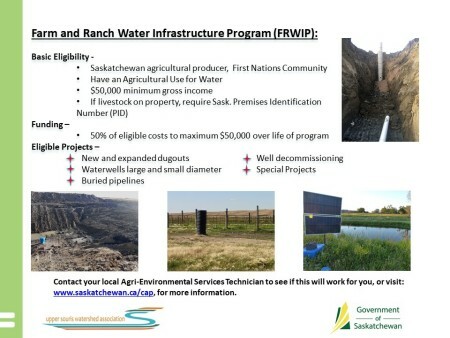 The watershed protection plan has been developed under the leadership of Saskatchewan Watershed Authority by holding meetings with local watershed advisory committees, that have local representatives from; rural and urban municipalities, First Nations, the Region 3 Metis Nation, agricultural organizations, industry, government and non-government organizations. A technical committee provided input into the concerns from the local committees and developed recommendations and actions to address these concerns. The plan has been completed and released in October of 2010. Please download a copy from the page "Watershed protection Plan". We are in the implementation phase, which includes working on the 40 key actions from the "Plan". As Posted by the Upper Souris Watershed Association. 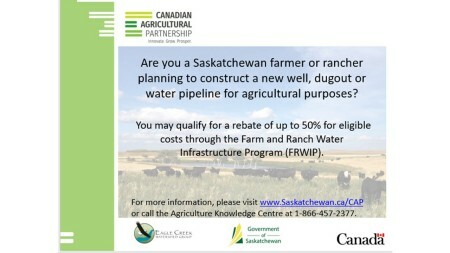 If you require further information on the Farm Ranch Water Infrastructure Program (FRWIP), please contact your local Agri-Environmental Technician or check out the Ministry of Agriculture Website at: www.saskatchewan.ca/CAP. 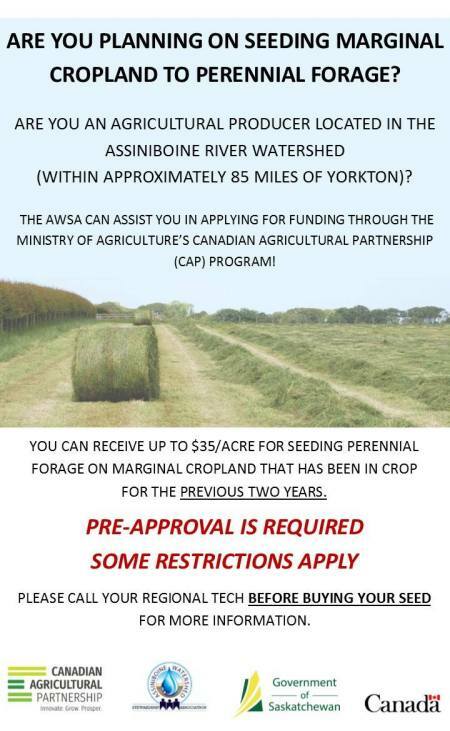 As posted by the Assiniboine Watershed Stewardship Association. 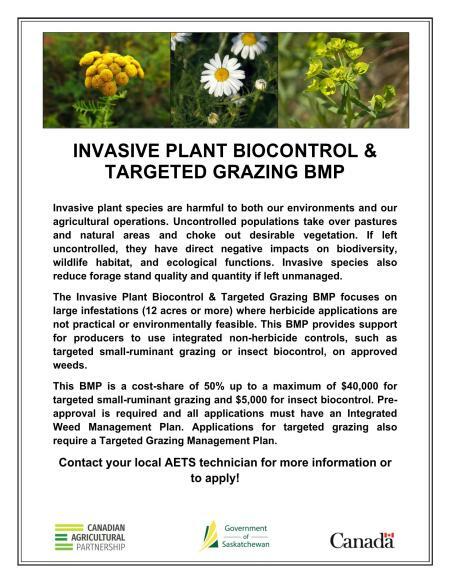 If you require further information on the tame forage seeding BMP, please contact your local Agri-Environmental Technician or check out the Ministry of Agriculture Website at: www.saskatchewan.ca/CAP. As posted by the Old Wives Watershed Association. 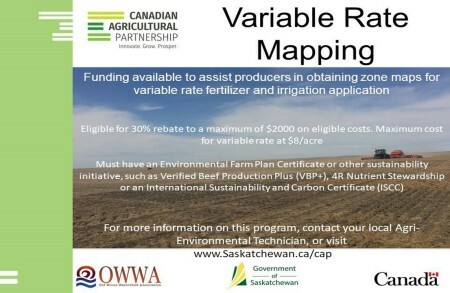 If you require further information on variable rate mapping, please contact your local Agri-Environmental Technician or check out the Ministry of Agriculture Website at: www.saskatchewan.ca/CAP. 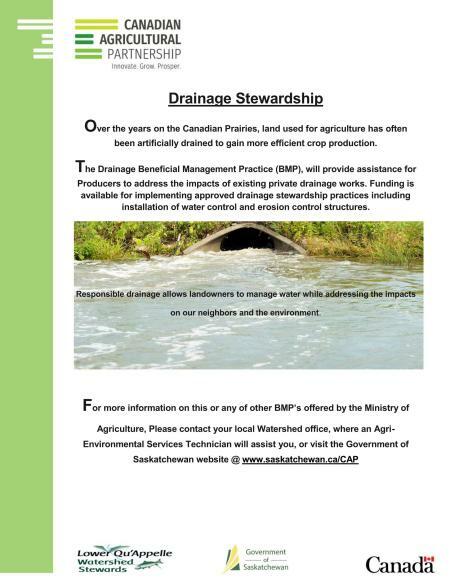 As posted by the Swift Current Creek Watershed Stewards. 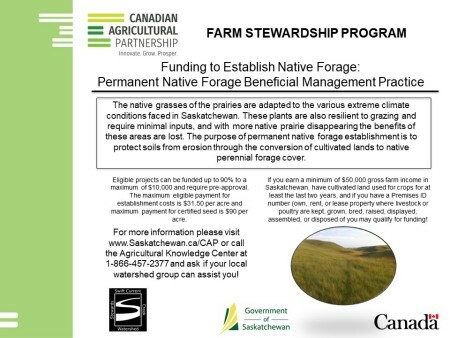 If you require further information on permanent native forage seeding, please contact your local Agri-Environmental Technician or check out the Ministry of Agriculture Website at: www.saskatchewan.ca/CAP. 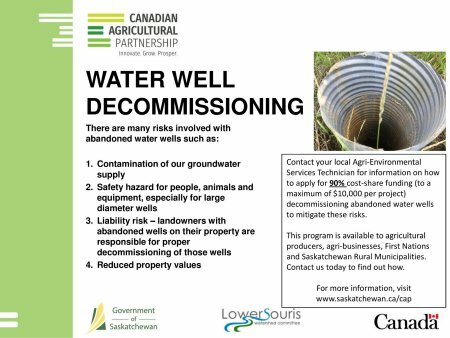 As posted by the Lower Souris Watershed Stewards. 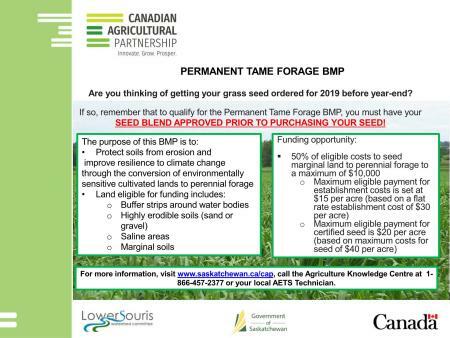 If you require further information on permanent tame forage seeding, please contact your local Agri-Environmental Technician or check out the Ministry of Agriculture Website at: www.saskatchewan.ca/CAP. As posted by the Eagle Creek Watershed Group. 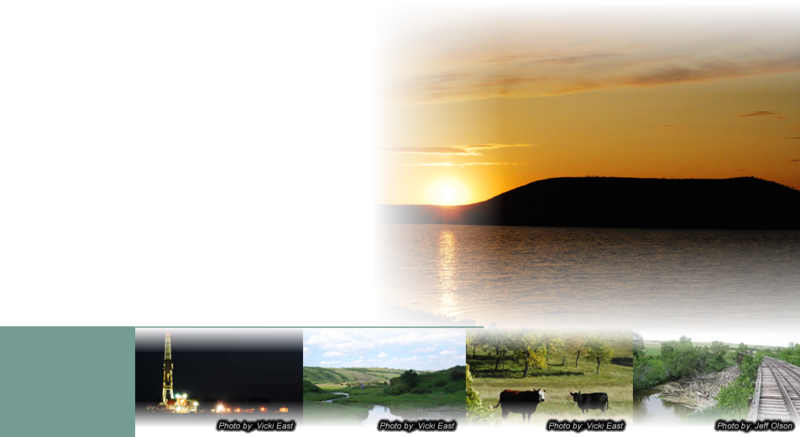 If you require further information on solar systems for your project, please contact your local Agri-Environmental Technician or check out the Ministry of Agriculture Website at: www.saskatchewan.ca/CAP. 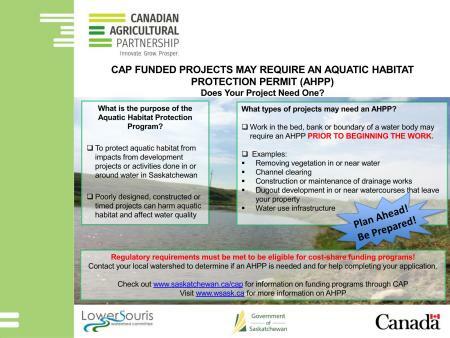 As posted by the Lower Qu'Appelle Watershed Stewards. 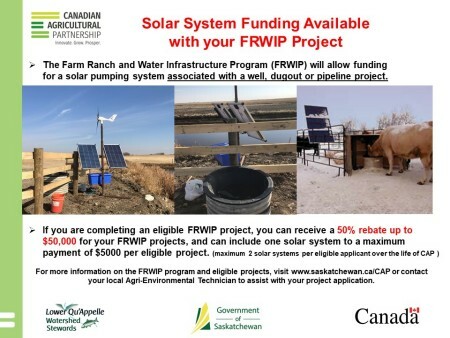 If you require further information on solar systems for your project, please contact your local Agri-Environmental Technician or check out the Ministry of Agriculture Website at: www.saskatchewan.ca/CAP. As posted by the Old Wives Watershed Association on their Facebook page. 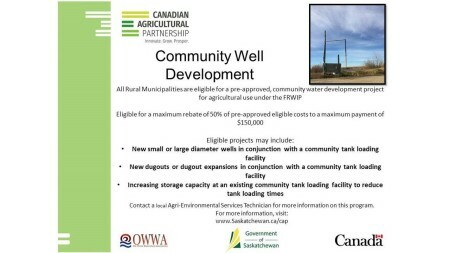 If you require further information on community well development, please contact your local Agri-Environmental Technician or check out the Ministry of Agriculture Website at: www.saskatchewan.ca/CAP. 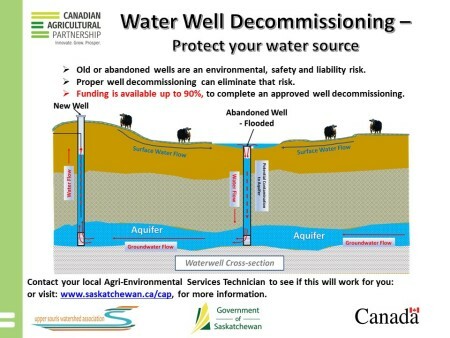 As posted by the Swift Current Creek Watershed Stewards (SCCWS). 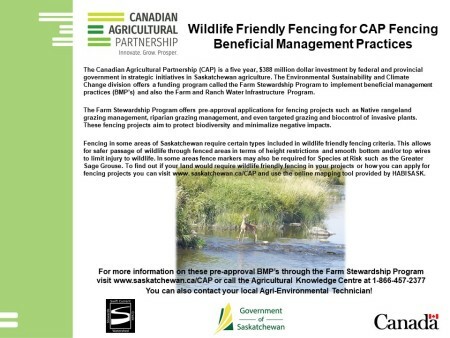 If you require further information on whether you require Wildlife Friendly Fencing for your project area, please contact your local Agri-Environmental Technician or check out the Ministry of Agriculture Website at: www.saskatchewan.ca/CAP. 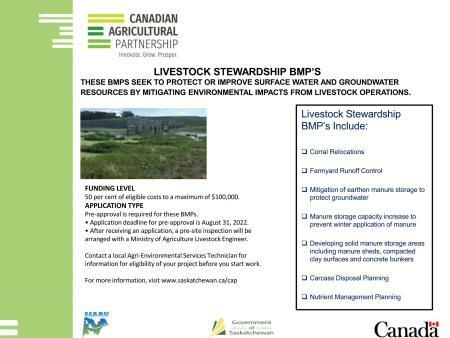 To learn more about the CAP programs and funding available for the Farm Stewardship Program (FSP), click on image to go to the www.saskatchewan.ca/cap website.